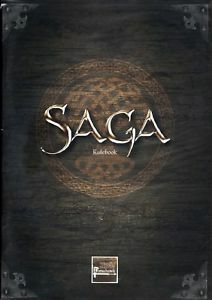 Last night myself and Adam had our first go at the new version of SAGA. As usual we played at the Hobby Bunker, it was quite busy there with a lot of 40k gamers. We did have quite a few players drop by to ask us about the game. There is certainly some interest. It is becoming more and more obvious to me that if you want to introduce players to new games you got to be out there playing them. We decided to play a 6 point game in the Age of Invasions universe, for ease of transition we went with the only scenario in the new rulebook: Clash of Warlords. Adam played the Scotti and I played the Saxons. As usual I will not write up an Action Report, but just provide a brief summary of the game. I was the attacker, and the game started well enough and I was able to throw a lot of SAGA rare dice early in the game. 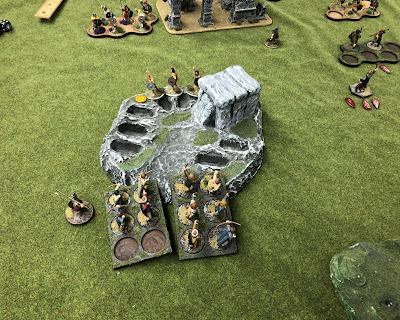 The Saxons are an aggressive force and have to attack to win. I had good dice early in the game especially with defensive throws. I was quickly able to take down 2 units of Scotti Warriors but on Turn 3, I left Hengist isolated and the Scotti were able to rain javelins down on him, he quickly was taken down. This was a pretty big blow and with this lost 2 SAGA dice. At this point the Scotti started to withdraw to protect their troops. Horsa in a fit of rage in Turn 6 attacked the Irish Warlord but again was taken down in a hail of javelins. Adam played a very good game and gained a 24 to 17 victory. The game starts to change with Hengist isolated with a much diminished unit of warriors. The Saxon levy having some sucess on the left flank, but as you can see to the right Hengist is exhausted and the wily Irish Warlord is advancing to throw yet another javelin. Horsa in a fit of rage advances by himself to melee the Irishman but has no Bodyguards . He is thrown back exhausted and some javelins take him down. The advancing Saxon warriors have run out of time, victory to the Scotti. We had no problem adjusting to the new versions of the rules, no question a great improvement. A great game has become even better! 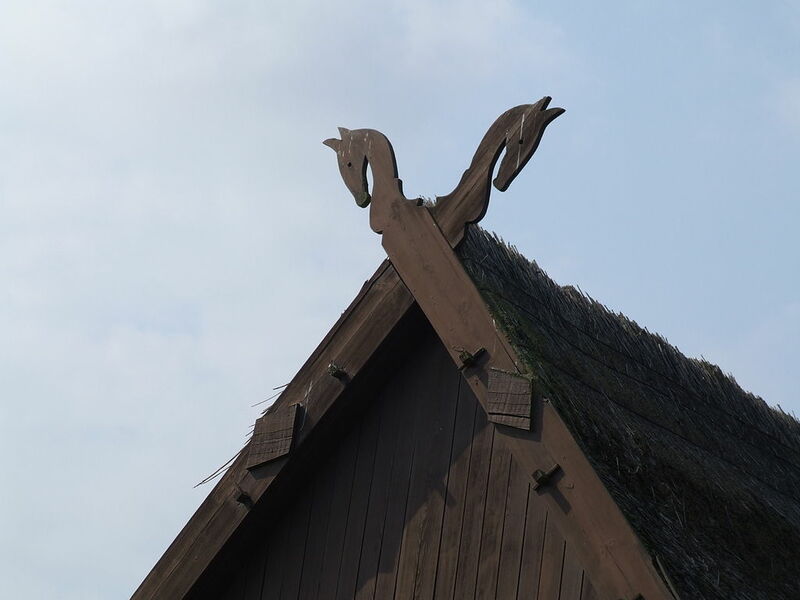 As an aside, Hengist and Horsa live on even now in Southeastern Germany in 2 headed-horse symbols. AHPCVIII Tenth Submission: More Folklore!